Aaron Jordan has been the Stevens County Attorney since 2011. He was originally appointed by the Stevens County Board and then elected to the office in 2014. Aaron is a veteran of the U.S. Air Force. He earned his undergraduate degree in Human Resources and Management from Park College in Missouri (Now Park University) and attended William Mitchell College of Law (now Mitchell – Hamline School of Law), graduating in 2001. He was admitted to the Minnesota Bar the same year and also is admitted to practice in Federal Court. 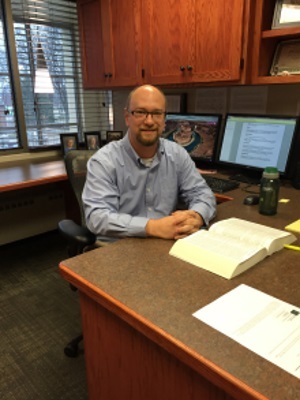 He began his legal career as a Judicial Law Clerk in Chippewa County, Minnesota. After that he was in private practice and also worked part-time for the Minnesota Public Defender’s Office. Then in 2008 he became an Assistant County Attorney in Cass County, Minnesota. Aaron grew up in rural North Dakota and Minnesota and has lived most of his life in rural Minnesota. Aaron is active in his community and with organizations within his profession. He currently serves as a board member with Stevens County Pheasants Forever. He is a committee member for the local Beyond the Yellow Ribbon chapter. Aaron serves as a director on the board of the Minnesota County Attorney’s Association, a member of the Minnesota County Attorney’s Association Ethics Committee, and is Chair of the 16th District Ethics Committee. He is a member of the Minnesota State Bar Association and 16th District Bar Association. A highlight of Aaron’s tenure as Stevens County Attorney has been advocating for and assisting with the creation of a Treatment Court in the Northern part of the Eighth Judicial District. The Treatment Court started in Stevens County in the Summer of 2014.